Occasionally fictional characters enter the common lexicon. For example, “Mickey Mouse” doesn’t just refer to the animated personality. In addition, we can use the term in a mocking way to describe something as “childish, oversimplified, unrealistic”. Another character known from Disney films also entered the dictionary. “Pollyanna” describes “an excessively or persistently optimistic person”. Unlike Mickey Mouse, the character of Pollyanna existed before she hit the silver screen in 1960. However, as often occurs, many people don’t recall the book very well anymore, as the film edition supplanted it. I never saw the film or read the book before I got the new DVD release. Frankly, I don’t think I missed much. Pollyanna accomplishes its goals, but I think the movie appears dull and lifeless for the most part. 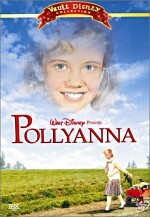 Pollyanna follows its titular protagonist, young Pollyanna Whittier (Hayley Mills). Her missionary parents die and she goes to live with her wealthy and powerful Aunt Polly Harrington (Jane Wyman). Polly dominates the small town of Harrington, a place long run by members of her family. The inhabitants live in fear of her wrath, and this tone creates a drab, lifeless community in which everyone seems fairly miserable. Some others decide to go against Polly’s will to fix the local orphanage. They don’t agree with her decision to patch it and think it needs additional work. To do so, they plan a town fair to riase money, but the fascistic Polly tries to stop this. In the meantime, Pollyanna’s bright and optimistic presence starts to thaw the community. She meets bitter and nasty folks like Mr. Pendegast (Adolphe Menjou) and Mrs. Snow (Agnes Moorehead), both of whom respond to her charms. She also influences town minister Ford (Karl Malden). He does what Polly tells him to do, but after his encounters with Pollyanna, he starts to learn what works best for the community. Basically, the film really revolves around Pollyanna’s encounters with the locals. We watch as the community slowly emerges from its stupor and starts to bring a smile to its collective face. Pollyanna offers a sweet experience, but it suffers from both its length and its blandness. The plot has so little to it that it can be tough to take at times. Director David Swift sets up the story in such black and white terms that not one moment of the movie comes as a surprise. We can see exactly where it’ll go well in advance of the actions. Aunt Polly and the townsfolk come across as such harsh and unlikable people that it seems hard to accept them as real. They feel more like plot devices; they’re little more than generic caricatures that the movie puts in place so we can watch Pollyanna work her magic. At least their development seems to occur at an acceptable pace. It didn’t come across as though Pollyanna actually worked magic; the participants responded appropriately to her glow. Unfortunately, late in the movie a negative alteration comes across as less believable. Pollyanna herself takes a turn for the worse and immediately becomes more bitter and cynical than Trent Reznor! This makes no sense and really feels artificial; it does little more than set up the requisite happy ending. Swift doesn’t help matters since he allows the movie to run much longer than it should. Pollyanna clocks in at a whopping 134 minutes, and that seems like at least 40 minutes too much. The film possesses a thin plot and the characters provide very little depth along the way. Admittedly, in this day of quick-cutting and rapid story exploration, it seems somewhat nice to watch a movie that takes such a languid pace. Unfortunately, it actively harms the film, as it makes a viewing much more of a chore than it should be. On the positive side, Pollyanna does present a good cast. We find a nice roster of solid character actors, and Mills does quite well in the title role. Pollyanna easily could - and probably should - have been absolutely insufferable, but Mills makes her likable and engaging. She presents a warm personality that communicates charm without the expected smugness. Without as skilled a performer, Pollyanna would have a total disaster. As it stands, Pollyanna seems like a mixed bag. At times the film comes across as fairly charming and likable. However, it suffers from a bland plot and a ridiculously excessive running time; a much shorter version of the story would seem much more entertaining. Pollyanna provides some entertainment but the viewer must muddle through a lot of dull sequences to get to those moments. 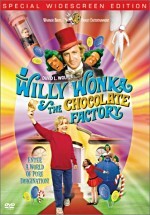 Pollyanna appears in an aspect ratio of approximately 1.75:1 on this single-sided, double-layered DVD; the image has been enhanced for 16X9 televisions. The picture looked acceptable for its age, but it didn’t provide a substantially above average presentation. Sharpness appeared erratic. The movie usually came across as reasonably distinct and accurate, but a number of shots looked fairly soft and fuzzy. The film rarely seemed really well defined. Though it mostly appeared adequate, it rarely rose above this level and was somewhat bland much of the time. Jagged edges and moiré effects offered no issues, but the picture displayed some light edge enhancement at times. Print flaws seemed surprisingly mild for a movie of this era. Light grain showed up periodically, and I also noticed a modest flickering at times. However, otherwise the movie appeared quite clean and fresh. I discerned almost no examples of speckles, grit, or other concerns during this nicely smooth presentation. Pollyanna displayed a somewhat muted appearance, and that affected the colors. They often seemed acceptably distinct, but much of the time they came across as somewhat flat and drab. The movie featured brownish skin tones and was generally a little blah in regard to its hue. Black levels seemed acceptably deep and rich, while shadow detail was slightly heavy but not too thick. Some low-light sequences came across as a bit murky, but they usually look fine. Overall, the image of Pollyanna worked okay for its age, but it didn’t do anything special. I felt the same way about the Dolby Digital 5.1 soundtrack of Pollyanna. If you’ve heard any of the other “Vault Disney” reviews, you’ll know what to expect from this one’s soundfield. As with Old Yeller and the other “Vault Disney” DVDs, here we found what I call broad mono. That meant much of the audio remained firmly anchored within the center channel. Actually, music showed reasonably decent spread across the front speakers, but I detected virtually no instances of any effects or speech that came anywhere other than the middle. In addition, the surrounds provided only the most general of reinforcement. A little light music may have popped up from the rears, but otherwise they remained very passive partners. Audio quality showed its age but appeared acceptable. Speech seemed somewhat thin and flat at times, but most of the lines came across as reasonably clear and distinct, and I noticed no concerns related to intelligibility or edginess. Effects played a fairly minor role in the film. Nonetheless, they appeared fairly clean and accurate, and they displayed no signs of distortion. Music remained the strongest aspect of the mix. The score and songs showed pretty decent depth and dynamics. While low-end response never seemed outstanding, the music demonstrated solid bass given the age of the material. The soundtrack for Pollyanna never seemed very ambitious, but it succeeded for a film of this vintage and genre. This two-DVD release of Pollyanna comes in the new “Vault Disney Collection” and its set of extras resembles the other packages. That means we get scads of supplements spread across the two platters. We begin with an audio commentary from actress Hayley Mills and director David Swift. Both were recorded together for this running, screen-specific piece. The two display a nice chemistry and appear to enjoy their interaction, but the results don’t provide a lot of good data about the film. On occasion, some solid notes appear, such as their experiences with Walt Disney, but much of the track simply seemed like bland nostalgia and an appreciation of the movie. In addition, quite a few empty spaces passed by without any remarks. Dedicated fans of Pollyanna may want to listen to this commentary, but I didn’t find it to offer much useful information. In addition to the audio commentary, DVD One provides a classic Disney short. In this case, we find a 1941 offering called Nifty Nineties. This one runs seven minutes and 31 seconds and offers a fairly bland and insipid short. Mickey and Minnie traipse through the period locale and not much of interest happens. It’s excessively cute and lacks much fun, though animation buffs will enjoy the presence of entertainers “Fred and Ward”, a nod to Disney cartoonists Fred sdajl and Ward Kimball. Note that this short can be viewed on its own or at the start of the film; to replicate the manned in which Disney flicks used to be shown, the cartoon appears as a “preview” feature before the movie itself begins. When you start the DVD, you’ll find the usual complement of advertisements. Here we get a preview of the upcoming theatrical release Lilo and Stitch as well as commercials for Max Keeble’s Big Move and Air Bud: Seventh Inning Fetch. From the main menu, you’ll discover a Sneak Peeks area that includes all of these promos plus trailers for the upcoming DVD releases of Monsters, Inc., Return to Neverland, and Beauty and the Beast. From here we move to DVD Two, which provides a full platter of extras. First up we discover a new documentary called Pollyanna: Making of a Masterpiece. This 28-minute and 58-second program offers a mix of film clips, archival materials - including a little behind the scenes footage from the set - and new interview segments with studio Vice Chairman Roy E. Disney, director David Swift, film historians Les Perkins and Stacia Martin, and actors Hayley Mills, Nancy Olson, and Kevin Corcoran. 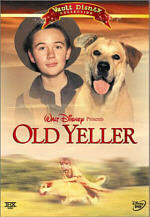 This program strongly resembled the piece created for Old Yeller, and it provided a fluffy but decent look at the movie. ”Masterpiece” gave us a good overview of the project. We learned about the original novel and its success and they went through the process by which Disney adapted it. We heard about working with Walt and the attempts to reduce some of the film’s more syrupy elements, and we also got notes about the cast, experiences on the set and other components. As with the Old Yeller documentary, much of the program seemed a bit goopy itself, as we got a lot of praise for the movie and the participants. It also included a few bits that repeated material heard in the commentary. However, the show appeared reasonably interesting, and I particularly enjoyed the discussion of Swift’s directorial style and some other production-specific notes. This remained a fairly superficial documentary, but it provided a decent look at the movie. Next we get Recreating Pollyanna’s America, a 14-minute and 55-second look at the film’s art direction. It provides the same mix of elements found in the documentary; here we hear from Swift, Mills, Corcoran, Olson, Stacia Martin, Les Perkins, and visual effects matte painter Peter Ellenshaw. This piece covers the sets, costumes and locations and offers a very nice examination of these topics. However, I think “America” probably should have been incorporated into the longer documentary; I see no reason for the material to sit on its own like this. 1912 is pretty much a throwaway piece. The two-minute and 54-second montage simply provides a cutesy look at the era. It alternates clips from Pollyanna with archival films and seems fairly useless, as it doesn’t really give us a substantial examination of the period. More interesting is Walt Disney Introduces Pollyanna, found in the “Lost Treasures” area. This six-minute and 33-second program gives us all of Walt’s December 1965 TV bits for the three-part broadcast of the film. It’s a fun piece of archival material. The Disney Studio Album gives us a montage. It runs for four minutes and 32 seconds and provides a snapshot of the studio circa 1960. We find out what they did during that year, and the information covers a wide range of topics; in addition to movies, we look at TV, the theme parks, and even projects then in developments. It’s a cool little bit. When we move to the Production Gallery, we get a 94 second running program that shows a mix of photos. This section is solely for the lazy, as the material it contains appears elsewhere in stillframe form. Watch this one only if you don’t like to bother with frame-by-frame access. Next we find a section with a theatrical trailer and one TV spot. The trailer runs a stunning four minutes and 12 seconds! Note that the TV spot actually advertises the broadcast of the movie, not its theatrical run. After this we move to A Day In the Life of an Actress, an examination of Nancy Olson’s daily activities on the film. This four-minute and 38-second featurette combines some stills, behind the scenes footage, and a contemporary interview with Olson. While not fascinating, it offers a generally interesting look at the workings of a movie set. Preserving Pollyanna examines the efforts to restore the film. It includes interviews with Richard Dayton, the president of YCM Labs, and film preservationist Scott MacQueen; the latter heavily dominates the program. This 11-minute and 16-second piece provides a very good look at their work. It discusses the impact TV had on movie storage, the Technicolor process, and all the attempts they made to restore Pollyanna to its original glory. In particular, the program focuses on the problems with the color elements, and it’s one of the better restoration examinations I’ve seen; it covers the topic much more thoroughly than usual. In The Pollyanna Collector, we find out just how much film historian Stacia Martin loves the movie. She leads us through a tour of various books, games, dolls, jewelry, records and other trinkets in this moderately compelling 10-minute and 58-second featurette. David Swift briefly pops up to discuss a curious aspect of a Pollyanna necklace that was sold at Disneyland. Another featurette covers Promoting Pollyanna. This six-minute and 27-second piece involves Martin, Les Perkins, Swift, Kevin Corcoran, and Roy E. Disney as it looks at various aspects of the film’s promotional campaign. We see a slew of posters and other ads and hear about concerns over the movie’s title and other problems. We’ll see all of the materials elsewhere, but the interviews make this a fairly useful little program. Next we locate scads of stillframe materials. In the Galleries area, we find 56 “Production Stills”. There’s some good stuff here, and most - if not all - of it gives us a clearer version of the footage in the “Production Gallery” montage. “Production Art” splits into three areas: “Concept Art” (11 frames), “Costumes” (4 images), and “Storyboards” (69 stills). The latter goes over the opening with Jimmy Bean and also the sequence with Pollyanna’s accident. “Biographies” provides listings for actors Mills, Jane Wyman, Richard Egan, Kevin Corcoran, Agnes Moorehead, and Karl Malden plus director Swift. Basically, these offer annotated filmographies; they lack much depth. Within the Advertising domain, we locate eight “Lobby Cards”, 12 “Posters”, and 17 shots of Pollyanna “Merchandise”; that domain mixes images of related records and a comic strip adaptation. In Documents, we see 29 frames of ads and various press materials. Lastly, the Screenplay Excerpt offers the scene in which Pollyanna first meets Aunt Polly. The text runs 18 screens, and the scene itself can be viewed from here, which I thought was a nice touch. Within the Audio Archives we get some cool material. First up we get one radio spot. More fun is the “Sound Studio” demonstration. This let us hear a scene from the film in different ways. You can watch “The Bazaar” in its final form or with just dialogue or music. This kind of feature isn’t unique, but it’s unusual to find it with such an old movie, and it’s a lot of fun here. Two songs appear. We can listen to Mills croon “Pollyanna” and “Jimmy Bean”. Why you’d want to hear these crummy tunes is a mystery to me, but they’re here nonetheless. “Story Album” includes some songs as well, but the 39-minute and 25-second audio piece offers a record release from the early Sixties. We hear Kevin Corcoran narrate the tale, which mainly consists of audio snippets straight from the movie. I can’t say I enjoyed the presentation, but I thought it was a cool addition to the DVD. Pollyanna probably did as well as it could with this kind of material, but I must admit it did little for me. The movie had some good moments, but it ran far too long and lacked enough story or depth to make me like it very much. However, I felt more impressed with this nice DVD package. Although picture and sound seemed unremarkable, they appeared fine for a film of this vintage, and Disney created a very nice set of extras to accompany the flick. As a movie and as a DVD, Pollyanna seemed to be the weakest of the initial four “Vault Disney” releases, but it still provided a solid package that should please fans.